The Aran Sweater takes its name from the set of islands where it originated many generations ago, off the West coast of Ireland. The Aran Islands lie at the mouth of Galway Bay, at the mercy of the relentless Atlantic Sea. The Islanders were fishermen and farmers whose lives and livelihoods were deeply intertwined. 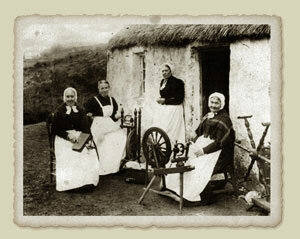 The Aran Sweater was born of this environment, passed down from generation to generation, and has since become the ultimate symbol of Irish Clan heritage. From its origins, the Aran sweater has been intimately linked to clans and their identities. The many combinations of stitches seen on the garment are not incidental, far from it. They can impart vast amounts of information to those who know how to interpret them. Aran sweaters were, and remain, a reflection of the lives of the knitters, and their families. 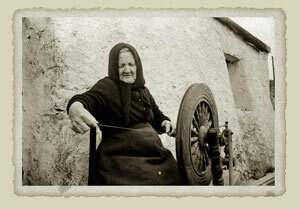 On the Aran islands, sweater patterns were zealously guarded, kept within the same clan throughout generations. These Aran sweaters were often used to help identify bodies of fishermen washed up on the beach following an accident at sea. An official register of these historic patterns has been compiled, and can be seen in the Aran Sweater Market on the Aran Islands. The Aran Sweater has many attributes which made it suitable clothing for the island's community of fishermen and farmers. It is water repellent, not allowing the rain to penetrate the sweater thus keeping the wearer dry. An Aran sweater can absorb 30% of its weight in water before feeling wet. The natural wool fibre used in the sweaters is breathable, drawing water vapour away from the skin and releasing it into the air, thus helping the body to maintain an ideal temperature. Most importantly, of course, an Aran sweater kept the wearer warm on the cold days and nights at sea or on the farm. Wool has an excellent insulating capacity due to the high volume of air in it, and this helps protect the wearer from excessive cold and heat. As a craft, the Aran Sweater continues to fascinate audiences around the world. A finished Aran sweater contains approximately 100,000 carefully constructed stitches, and can take the knitter up to sixty days to complete. It can contain any combination of stitches, depending on the particular clan pattern being followed. Many of the stitches used in the Aran Sweater are reflective of Celtic Art, and comparisons have been drawn between the stitches and patterns found at Neolithic burial sites such as Newgrange in Co. Meath. Each stitch carries its own unique meaning, a historic legacy from the lives of the Island community many years ago. The Cable Stitch is a depiction of the fisherman's ropes, and represents a wish for a fruitful day at sea. The Diamond Stitch reflects the small fields of the islands. These diamonds are sometimes filled with Irish moss stitch, depicting the seaweed that was used to fertilise the barren fields and produce a good harvest. Hence the diamond stitch is a wish for success and wealth. The Zig Zag Stitch, a half diamond, is often used in the Aran Sweaters, and popularly represents the twisting cliff paths on the islands. The Tree of Life is one of the original stitches, and is unique to the earliest examples of the Aran knitwear. It again reflects the importance of the clan, and is an expression of a desire for clan unity, with long-lived parents and strong children. Today, the demand for the Aran Sweater continues to grow. The lack of skilled knitters, and the economic gains to be had from machine-production of the sweaters, has resulted in a huge fall in the number of hand-knits available. Hand knit Aran Sweaters have become rare and valuable. They are highly sought after for their quality, their history, and the clan heritage they represent. Despite the huge increase in fashion goods available in Ladies Aran Knitwear, Mens Aran Knitwear and Childrens Aran Knitwear, the Aran Sweater remains an item of timeless beauty, synonymous with pride in an Irish heritage. As the craft spreads far beyond its humble origins on the wind ravaged islands of the west coast of Ireland, so too does its recognition as a fine work of art and an emblem of Irish Clan identity.